Towards Parenthood is a self-help workbook supporting soon-to-be and new parents prepare for the emotional changes and challenges of parenthood. It strengthens your relationship with your baby and your partner, while providing coping strategies to help you transition to your new role. Adjusting to the demands of parenting is challenging for us all – this book can help. Each Chapter contains illustrations and reflective activities to help parents prepare and juggle the enormous and unexpected changes that come with a baby. The book explores expectations of parenthood, coping skills, problem-solving, ways to enhance self-esteem, assertive communication, bonding with your baby and understanding your baby’s cues. It is suitable for mothers and fathers. Towards Parenthood is also available in Italian and Dutch translations. Chapter 9: Welcome to ‘The Club’! 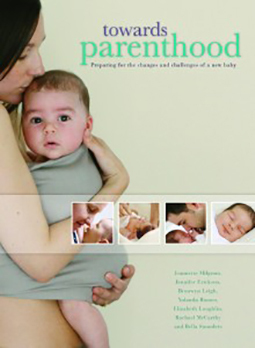 The content in the Towards Parenthood book was extensively piloted with Australian families. Research conducted by the Parent–Infant Research Institute (PIRI) and funded by beyondblue: the national depression initiative indicate Towards Parenthood provides helpful information to make a difference to the positive adjustment of pregnant women and their partners. Pregnant women who participated in the research and received the Towards Parenthood intervention were found to be less anxious, less stressed, and have fewer symptoms of depression after having their baby compared with those who did not receive Towards Parenthood. Towards Parenthood was written by a team of psychologists and therapists at the Parent Infant Research Institute (PIRI), a not-for-profit organisation dedicated to improving the emotional wellbeing of parents and infants. Authors: Prof. Jeannette Milgrom (Executive Director, PIRI), Jennifer Ericksen, Dr Bronwyn Leigh, (Director Centre for Perinatal Psychology), Yolanda Romeo, Elizabeth Loughlin, Rachael McCarthy & Bella Saunders.